This is very simple circuit and is really intended for hobbyists who like experimenting with infrared or with VFETs, or even both, for tha's what this all about. This circuit diagram shows an infrared transmitter in it as simples, most elementary form. 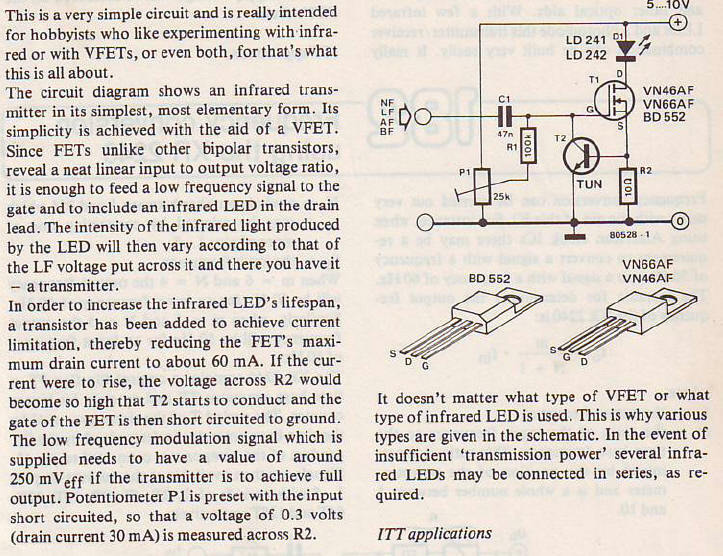 Its simplicity is achieved with the aid of a VFET. Since FETs unlike other bipolar transistors, reveal a neat linear input to output voltage ratio, it is enough to feed a low frequency signal to the gate and to include and infrared LED in the drain lead.